This 41"x58" oil on board painting was created by Lawrence Beall Smith for Upjohn Laboratories, to promote the good health of your child. The printed ad, which appeared in The Saturday Evening Post, takes on the question as to whether a child should have his or her tonsils removed. This painting was displayed in Upjohn's corporate headquarters in Michigan from the time it was created, until a few years ago. It has a brass tag attached to the back of the original frame, stating that it was created for Upjohn. This boy is wearing an Indian headdress, and is also dressed in his dad's World War II Navy uniform. He has been playing marbles, has drawn a picture of himself dressed as an Indian, and has lassoed the chair with his rope. 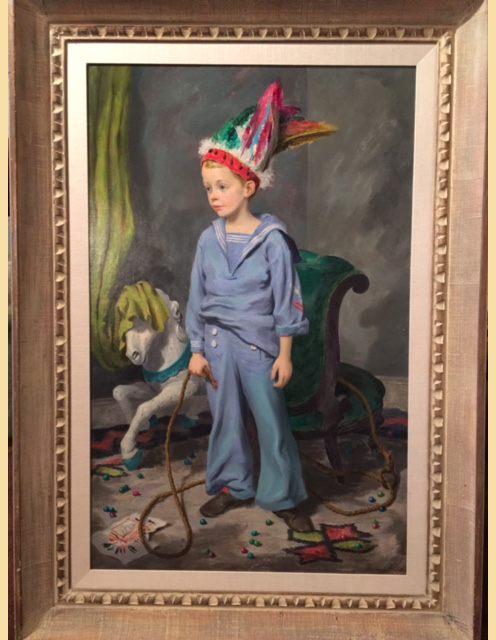 This was all a typical form of play for children in the 1940's, making this painting a special piece of Americana from a bygone era, forever etched in the memories of many. Lawrence Beall Smith was born in 1909. He studied at the Art Institute of Chicago and the University of Chicago. He also studied in Boston and Gloucester, MA with Ernest Thurn, Charles Hopkinson, and Harold Zimmerman. Upjohn Laboratories, a pharmaceutical company, commissioned many paintings from Lawrence Beall Smith over a span of several years. Norman Rockwell was also commissioned by Upjohn to create advertising images for them as well. Many of these paintings depicted children in an Americana setting, promoting the good health and well-being of children. He was commissioned by Abbott Labs in 1944 to cover the Medical Corps in Europe during World War II. He served as an artist at the D-Day landings of Allied troops on the Normandy beaches, as well as painting posters to promote the sale of war bonds. He founded the Katonah Gallery (which is now the Katonah Museum) in Westchester County, NY. He also illustrated books such as Robin Hood in 1954, and Tom Jones in 1964. The art collections of the US Air Force and Navy both have examples of Beall Smith's paintings depicting World War II. Lawrence Beall Smith passed away in 1995.